Wool comes from sheep. They grow a wool coat and once a year this wool coat is sheared off the animal. In Wisconsin, this is frequently done in the early spring shortly before they have their lambs. A shorn ewe will be more likely to stay out of the wind and bad weather and protect her new-born lamb if she does not have a thick wool coat on her. The shorn wool coat is called a fleece. It is also called "grease wool" because of all the oil and lanolin in the wool. This fleece must be cleaned before it can be processed into wool yarn. There is much vegetable matter, manure and natural oil that must be removed. Sometimes as much as 50% of the weight of the fleece is not wool. The wool from the back end of the sheep, their legs and sometimes their belly is too full of manure to use. These are referred to as "tags" (as in the phrase "tag end"). These are removed first before washing the fleece; this process is called skirting, as all the edges of the wool coat are removed. The fleeces are also sorted into the various types: fine from coarse and short from long. The grease must then be removed from the wool. This can be done using soap or detergent and a lot of water or it can be done by submerging the wool in an acid bath which dissolves all the vegetable matter as well as the grease (this is called scouring). The washed and dried wool is then "teased" or "picked" which is the beginning of the process of opening up the locks of wool and turning it into a consistent web. The wool is put through a picker which opens the locks and blows the fluffy wool into a room. At the same time a special spinning oil is added which helps the wool fibers slide against each other but also helps them stick together as a fine web through the processing. 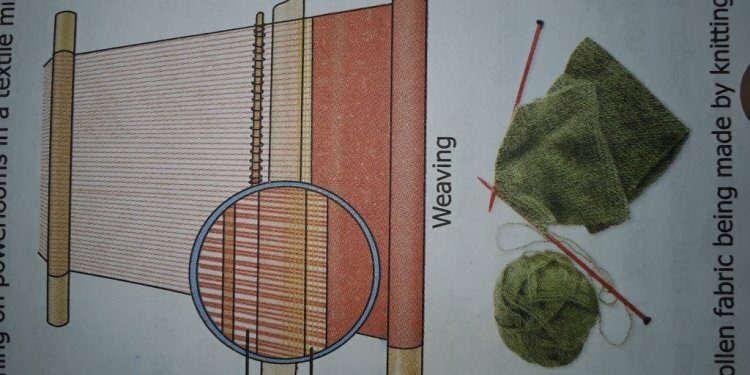 The wool fibers are then put through a series of combing steps called carding. This can be done with small hand cards that look much like brushes you would use on a dog. It can also be done on a larger scale with machine driven drums covered with "card cloth" which combs the wool many times by transfering it back and forth from one drum to the other as it is passed down the series of drums. We have "woolen"cards which produce a wool web with the fibers coming off in random alignment. This is in contrast to "worsted" combing that lines up all the fibers (as you would see in thread). The final step in the carding process divides the web into small strips called pencil rovings. These are collected on large spools on the end of the card. These spools of pencil roving will be placed on the spinning frame to make yarn. Pencil roving is too delicate to be handled much, so when proccessing fiber for handspinners the roving is taken off the machines earlier and wound into balls. The roving as it comes off the card has no twist. It is held together by the oil and natural hooks that exist on the surface of the wool fibers. The spinning frame will put the actual twist on the roving and turn it into yarn. This is collected on wooden bobbins. The frame we have is small but it can spin up to 90 threads at one time. This only spins one ply yarn (single stranded), which is not as sturdy as most prefer. In order to make two or more ply yarn the strands are twisted together on the plyer, from several cones onto fewer spools. When the wooden bobbins are full of yarn, they are placed on a cone winder and the yarn is transferred to paper cones for use in weaving and knitting machines. It could also be put into skeins of yarn which are the form that knitters like to use. There are many ways of finishing the yarn. It is sometimes necessary to remove the lubricant by washing, which also "sets the twist" which allows the fibers to open up, fluff out and make a loftier yarn. Sometimes the wool is woven or knitted directly from the cone and is washed and blocked in its final form (as cloth, socks, sweaters, etc.). Copyright © 2019 l www.xinlongtex.com. All rights reserved.